One World is a non-governmental, non-profit organization working to promote global democracy and world federalism. Our main activities are public education and awareness raising about the need for a more democratic global politics. We also participate in international coalitions that advocate for specific reforms in the UN and the wider global system, and we run campaigns on a range of issues related to global democracy. Inspired by such visionaries as Einstein and Gandhi, we regard inclusive federal democracy at the global level as a necessary precondition for justice, peace and prosperity for all of humanity. One World is an Associate Member of the World Federalist Movement (WFM), a New York based umbrella organization for groups promoting global democracy and world federalism in different parts of the world. The WFM was founded in 1947 as a non-profit, non-partisan organization committed to the realization of global peace and justice through the development of democratic institutions and the application of international law. The WFM works on comprehensive set of programs that seek to facilitate transparency in global governance; protect civilians from the threat of genocide, war crimes, and crimes against humanity; increase access to justice; and promote the application of the rule of law. The WFM works in partnership with the United Nations, governments, and other international and regional institutions around the globe to advance a mission of peace, prosperity, and security for all. One World is a member of many of the advocacy coalitions run by the WFM and One World’s Director and Chair both sit on the WFM Council. 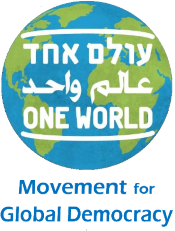 One World is registered in Jerusalem and is active in Israel-Palestine, and globally.